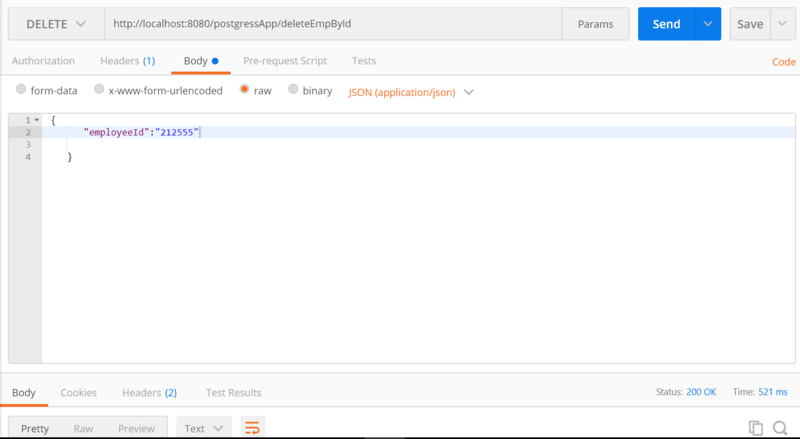 In this article, we will see the steps to set up a Spring boot application with PostgreSQL. In this article, we will see the steps to set up a Spring Boot application with PostgreSQL. 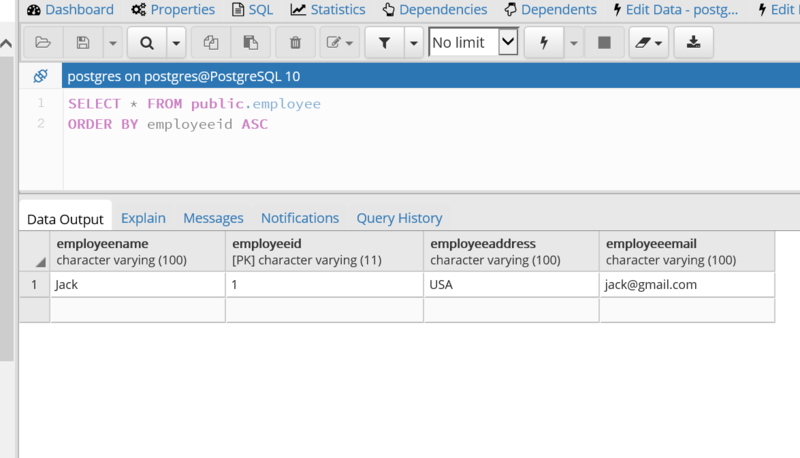 We will have a simple CRUD operation in Postgres Database by exposing the application via Rest API. 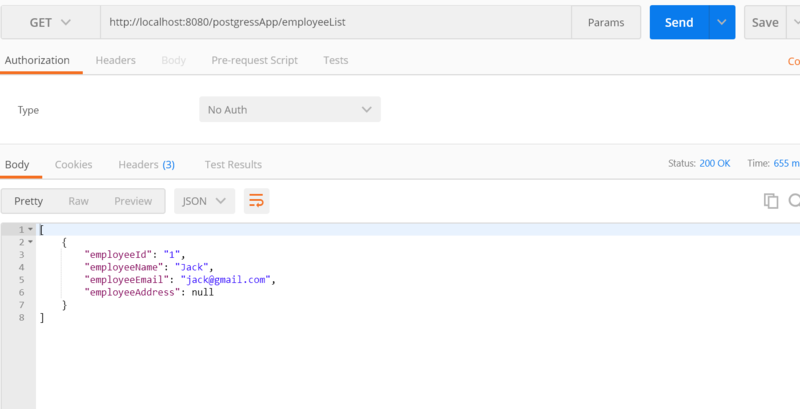 We will use POSTMAN to test the application. org.postgresql.postgresql will have the dependency of postgres jdbc driver in runtime. Create a schema.sql in resource folder. An employee table will be created in server startup. This can be ignored if you don't want the initial database to be configured during server start. Generally, for building a production-ready application, this step can be ignored as tables will be created with scrip directly in the DB. 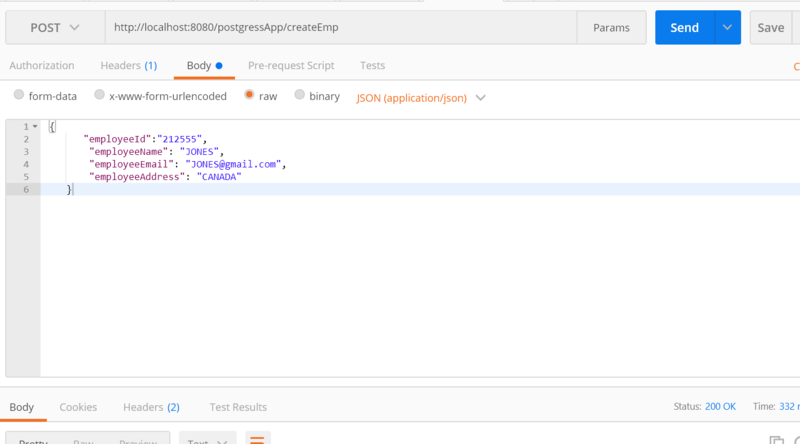 Changes in application.properties to configure the data source with URL, username, and password of the Postgres DB. 5432 is the default port of Postgres. Hibernate will automatically pick up the postgressSQLDialect. spring.jpa.hibernate.ddl-auto will turn off the hibernate auto-creation of the tables from the entity objects. Generally, Hibernate runs it if there is an Entity defined. But we will be using a native SQL query with JdbcTemplate, hence, we can turn this off as we will not be creating an Entity. spring.datasource.continue-on-error=true will continue application startup in spite of any errors in data initialization. spring.datasource.username username for the database. spring.datasource.password password for the database. Create a dao interface and dao implementation. We have learned how to set up a Spring Boot application with Postgres and how to do a CRUD operation. You will find the complete code here.